Hip hop music has gone through many changes since it was created in the late seventies. The hip hop playing on radio everywhere now is much different than the tracks Kurtis Blow and Fab Five Freddy were creating when hip hop was invented. Regardless of the music's evolution, hip hop's defining characteristics are syncopated drum rhythms (usually built with samples), the use of turntables and an MC rhyming spoken lyrics on top. When hip hop was created, soul and Motown records from the 1960's and 70's were used to provide the backbeat (drums) as well as melodic content. Now, professional and amateur producers are building drum beats for hip hop artists in their bedrooms but the drums are always syncopated, meaning the downbeats of '2' and '4' are sometimes emphasized and sometimes not. The drums being sampled now may be syncopated throughout, meaning beats "1" and "3" are sometimes shifted and chopped up as well. Hip hop DJs used and continue to use the turntables as an instrument. By scratching and shifting the pitch and speed of the records, they can treat the turntables the way a jazz musician would, improvising over the track that's playing on one table and switching back and forth at will, manipulating the grooves and melodic content. Done well, it's like watching a jazz musician take a great solo over the melody of a tune. Another characteristic of hip hop is the MC. 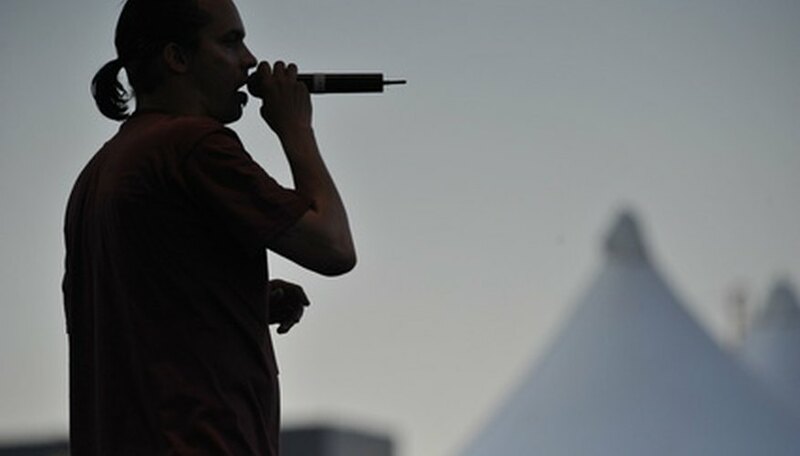 He is the storyteller in the hip hop track. The lyrics could be about anything depending on the subgenre of hip hop you listen to, but the MC's ability to rhyme well and tell a story is what gives him credibility. You'll find an MC in almost every hip hop track (usually along with a vocalist driving in the hook or the chorus melodically). Jessica Nelson has been writing for various publications since 2000. She has contributed to "The Village Voice," "L Magazine (New York)," "Phoenix New Times," "Venus Magazine (Chicago)" and "San Diego City Beat." Nelson holds a Bachelor of Arts in music from Arizona State University, as well as a Master of Fine Arts in performance and interactive media from Brooklyn College.